A unique adaptation of a hardwood-top workbench creates an efficient, good looking, and organized center where golf clubs and golf bags can be repaired and maintained. All units include an aerial shelf and one drawer. Casters are optional. All come with an aerial shelf and one drawer. Optional casters Part Number 2203. 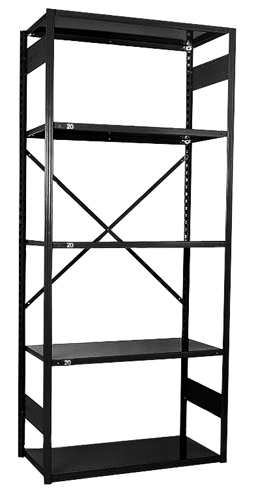 Complete shelving and cabinet designs are available to store shoes, tools, equipment and accessories. 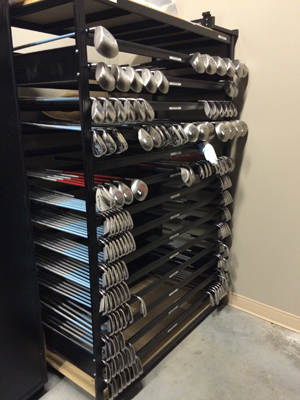 Keep everything in the club house organized and accessible with durable and attractive products from Clubstor. 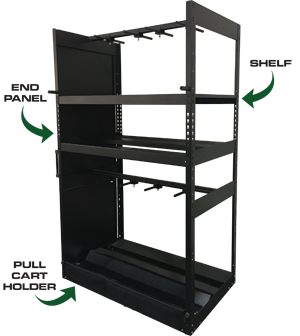 Clubstor by EQUIPTO offers traditional 18-gauge V-Grip™ shelving to provide maximum load-bearing capabilities and a new lighter capacity, lower cost solution - V-Grip™ 20. 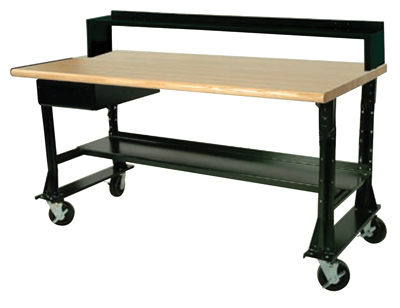 Both have an exclusive triangular design that provides a smooth front surface without unsightly holes or hardware and a clip system that allows the shelving system components to be adjustable for convenient reconfiguration to accommodate high-rising applications to reduce wasted overhead space.